This paper is an adaptation of the recent systematic review published in the Journal of Bone and Mineral Research by the International Task Force on Osteonecrosis of the Jaw, a Canada-led initiative supported by 14 national and international societies dedicated to advancing the care of oral bone health including medicine, surgery, dentistry, oral pathology and imaging. This work provides a systematic review of the literature from January 2003 to April 2014 pertaining to the incidence, pathophysiology, diagnosis, and treatment of osteonecrosis of the jaw (ONJ), and offers recommendations for its management based on multidisciplinary international consensus. The term "osteonecrosis of the jaw" was introduced by Marx in 20033 and subsequently by Ruggiero et al in 2004.4 Non-healing exposed areas of jawbone were associated with the use of intravenous bisphosphonate therapy. ONJ has also been referred to as BRONJ (bisphosphonate related), ARONJ (antiresorptive related) and more recently MRONJ1 (medication related). The International Task Force recommends using ONJ as the condition is presently known to be associated with 2 classes of drugs: bisphosphonates and denosumab. There may also be an association with antiangiogenic agents, which requires further investigation. In a recent paper from the American Association of Oral and Maxillofacial Surgeons (AAOMS), the antiangiogenic agents have also been included as potential causative agents however the International Task Force believes that the data linking antiangiogenic agents and ONJ requires further substantiation.1 In time there may be other agents linked to ONJ as other antiresorptive agents are being developed for the treatment of osteoporosis and skeletal metastases. Following this classification, BRONJ would now be used specifically for those cases directly related to bisphosphonate use. ONJ has been a concern particularly in those individuals on high dose parenteral antiresorptive agents and this has been a major concern for general dentists, dental specialists (mostly OMF surgeons and pathologists) and hospital-based dentists treating oncology patients. As well, medical oncologists who are prescribing these drugs have become acutely aware of the condition and are concerned regarding the optimal dose and duration of therapy. Patients who receive bisphosphonate or denosumab therapy for metastatic cancer and multiple myeloma receive monthly treatment with the medication administered intravenously (for bisphosphonates) or subcutaneously (for denosumab). Patients with osteoporosis or other bone disease such as Paget's disease require antiresorptive therapy at much lower doses. They receive 60 mg of denosumab every 6 months or 5 mg of zoledronic acid every 1 to 5 years. Another antiresorptive agent associated with ONJ is denosumab. This molecule is a monoclonal antibody to receptor activator of nuclear factor K-B ligand (RANKL).5 RANKL binds to its receptor RANK on preosteoclasts as well as osteoclasts and is essential for the formation, function and survival of osteoclasts. Denosumab is effective in the treatment of osteoporosis and lowers the risk of fracture. It can also be used in high doses in individuals with metastatic cancer, and has been shown to reduce the risk of skeletal-related events. In addition to drugs causing ONJ, it is recognized in literature that ONJ can develop spontaneously and has been described as lingual mandibular sequestration and ulceration (LMSU) or oral ulceration with bone sequestration (OUBS).7 The incidence of ONJ in the absence of antiresorptive therapy is unknown. It is recommended that a causal role not be attributed to bisphosphonate use in healthy patients taking oral bisphosphonates. Future research is required to determine if OUBS is an initiating event in oral ONJ cases or alternately, whether bisphosphonate use may delay the resolution of OUBS and be regarded as a distinct clinical pathologic entity. There are discussions whether to include a stage 0 category to represent cases with no bone exposure but with non-specific symptoms or radiographic findings not explained by an odontogenic cause in patients on antiresorptive medications.1 The International Task Force did not recommend the use of stage 0 as it may potentially overdiagnose ONJ in a large number of individuals who may never actually develop ONJ. While the AAOMS group included anti-angiogenics in their causative medication list, the evidence that this class of drugs alone increases the ONJ risk is based on case reports and requires substantiation. These findings are based primarily on biopsy material derived from cancer patients receiving IV bisphosphonates. Although these features do appear characteristic for ONJ cases (at least in cancer patients), it is not certain whether they can be reliably translated to ONJ occurring in osteoporosis patients receiving oral bisphosphonates or whether they are sufficient to distinguish reliably between osteonecrosis or osteitis or osteomyelitis occurring for other reasons. It has been proposed that serum C-terminal telopeptide of type-1 collagen (CTX), a break down product of type-1 collagen during bone resorption, can be followed in the patient's serum as a risk indicator for development of ONJ.28 Serum CTX is however expected to be suppressed with bisphosphonate therapy and is not a useful indicator of the risk of ONJ in those on BP or dmab therapy. Antiresorptive therapy reduces the biomarkers by approximately 50% and serum values reflect total body rates of bone remodeling. Biomarker levels are not useful in predicting the risk of ONJ or in the management of the ONJ lesions. Imaging is of value in diagnosing ONJ. This is particularly the case in individuals on antiresorptive therapy with ONJ-like symptoms but without obvious bone exposure. As periapical and periodontal disease is an important risk factor for ONJ, identifying early dental disease with imaging and proceeding with dental preventive measures may decrease the risk of ONJ and minimize the need for dental extractions.63,64 In addition, imaging enables exclusion of other conditions which may contribute to necrosis, such as metastatic disease.65,66 There are no pathognomonic features of ONJ on imaging which definitively differentiate ONJ from other conditions.67 However, imaging can assist in identifying the extent of bone and soft tissue disease as well as providing information on dental, periodontal and periapical health. Figures 1 and 2 provide clinical and radiographic images of patients with Stage 1 and 2 ONJ, respectively. Plain radiographs are often sufficient to support the diagnosis of ONJ. Advanced imaging may become necessary if the diagnostic information obtained via plain films is incomplete or to assess the extent of the changes in cases of surgical intervention. Figure 1. Clinical and radiographic images of a patient with Stage 1 osteonecrosis of the jaw. a) Clinical photograph showing failure of healing and small area of bone exposure after extraction of the second right mandibular molar (yellow arrow). b) Part of panoramic radiograph showing lack of extraction socket healing (yellow arrow), and thickened lamina dura (green arrow). c) and d) Axial multislice CT images indicate lack of bone healing in the extraction socket (yellow arrow) and diffuse osteosclerosis of the alveolar bone in the posterior right mandible (black arrows). e) T1 weighted image shows reduced bone marrow signal intensity (white arrow) in the alveolar bone of the right mandible extending almost to the mid-line. f). Fat saturated T2 weighted image indicates increased signal intensity (white arrowhead) over the affected area of the alveolar ridge. Figure 2. Clinical and radiographic images of a patient with Stage 2 osteonecrosis of the jaw. 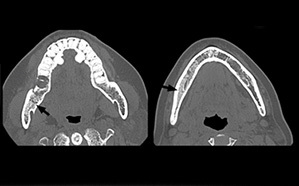 a) Clinical photograph shows extensive bone exposure and inflamed surrounding soft tissues in the posterior right mandible. b) Panoramic radiograph shows altered trabecular architecture with increased trabecular density (arrows) and a probable sequestrum formation (arrowhead) c) Sagittal, d) Axial, and e) Coronal sections of the area of interest. Near complete opacification of the mandible (arrows), with extensive periosteal bone formation (double arrows) and sequestration (arrowheads) are observed. X-rays are useful screening tools for assessing the presence of dental disease and the severity and extent of osteonecrotic changes, as well as for follow-up of patients with ONJ. Computed tomography (CT) and cone beam computed tomography (CBCT) have clear advantages over 2D imaging in characterizing the features of ONJ. The cortical and trabecular architecture of the maxilla and mandible can be evaluated as well as the presence of periosteal bone reaction, presence of sequestrum and integrity of adjacent vital structures, allowing for earlier detection of ONJ lesions.32,40 Radiographic features of osteosclerosis can be seen in the absence of clinically exposed bone46 and in individuals with symptoms of bone pain careful evaluation is advised as these radiographic features may be a reflection of an early prodromal phase of ONJ. C. In patients in whom ONJ is a clinical consideration on low or high dose anti-resorptive therapy presenting with oral symptoms, CBCT or CT imaging may aid in evaluating early changes in the cortical and trabecular architecture of the maxilla and mandible. Imaging also allows assessment of possible sequestrum or fistula track formation and to evaluate the status of any involved teeth. If both CBCT and CT are available, small FOV, high resolution CBCT is preferred as it delivers less radiation and provides similar diagnostic information as CT.
CBCT may be performed in conjunction with bitewing, periapical and panoramic radiographs. If clinically indicated, MRI may provide additional information of the presence and extent of osteonecrosis. D. Patients with clinical ONJ under conservative management (stage 1 and 2). The nature and extent of osseous changes around the area of clinical bone exposure can be evaluated with CT or CBCT imaging. Dental disease in all existing teeth should also be determined with bitewing, periapical and panoramic radiographs. E. In patients with clinical ONJ where surgical intervention is considered (stage 2 and 3), CBCT or CT may be complemented with MRI, bone scan or PET for a more thorough evaluation of involved bone and soft tissues. Aside from recognizing signs of the disease, it is important for dental patients at risk of developing ONJ to maintain meticulous oral hygiene and regular dental visits. In general, dental care should be optimized in individuals at risk for developing ONJ. It is important to maintain optimal dental health of both hard and soft tissues with regular professional maintenance and very good home care. Any surgical therapy should be minimized, especially if there is an alternative (endodontic treatment instead of extraction, for example). Any minor oral surgery—including extractions and periodontal surgery—should include antibiotic prophylaxis, both systemic and topical, careful surgical technique, minimizing sharp bony edges and providing primary closure over bony wounds wherever possible. There is no need for interruption of oral bisphosphonate therapy such as that taken for osteoporosis therapy, either before or after the minor surgical procedure. For those on high-dose bisphosphonate or denosumab IV therapy or with multiple risk factors for ONJ, it is recommended that the antiresorptive therapy be withheld following the oral surgery until the surgical site has healed with mature soft tissue closure over the wound. This typically requires 4 to 6 weeks. For individuals at a high risk of ONJ, it is critical to achieve primary closure and utilize perioperative antibiotics up to a week following and chlorhexidine mouth rinses immediately before and for the weeks following until soft tissue coverage is achieved. Other routine restorative, hygiene, orthodontic and endodontic dentistry can be conducted as usual. Most patients will not require surgical intervention. A patient failing conservative therapy or whose ONJ is progressing should be referred to and managed by an OMF surgeon. As not all of them might be familiar with managing these patients, it is necessary to refer to an experienced OMF surgeon for appropriate care. This may require traveling to a larger urban center. They may refer the patient back to their primary dental caregiver for ongoing care in the presence of persistent ONJ or in its absence following surgical treatment. There is however a small number of experienced hospital-based dentists who are able to evaluate and manage these patients non-surgically in consultation with their medical oncologists. These clinicians are most familiar with this disease and may be best to perform non-surgical therapy and follow these patients conservatively. For stages 1 and 2, conservative therapy may be all that is required. Meticulous oral hygiene, preventive care, topical antibiotic rinses such as chlorhexidine, and periodic systemic antibiotics should be used as needed. Patients require close follow-up with periodic radiographic assessment of their disease. While many patients are symptomatic from their ONJ lesions, a significant number are asymptomatic and require close monitoring while maintaining excellent oral hygiene and ensuring that the affected area is clean with monitoring for progression of disease. Spontaneous resolution of ONJ is possible. Early treatment recommendations discouraged surgical intervention, with conservative therapy continuing indefinitely or until there was progression of disease. Others have had reasonable success with surgical management.72,73 There is still no comfortable proven treatment algorithm for the various stages of the disease. The International Task Force believes that surgical intervention is required for stage-3 disease and stage-2 patients who are showing progression or require continual antibiotic or narcotic analgesic therapy to control their symptoms. There is no funding for this paper. However funding for the primary paper in the Journal of Bone and Mineral Research (JBMR) was provided in part by the Canadian Association of Oral and Maxillofacial Surgeons. This paper is adapted from the publication in the JBMR by the International Task Force on ONJ. Permission is granted by the 2 lead authors of this task force (AM and AK), who are also the lead authors of this paper. Acknowledgements: The authors would like to recognize and thank Dr. Shawn Davison, PhD, for his scientific writing efforts in the research and preparation of this and the larger parent manuscript from which this is derived. Ruggiero SL, Dodson TB, Fantasia J, Goodday R, Aghaloo TL, Mehrotra B, O'Ryan F. American Association of Oral and Maxillofacial Surgeons. American Association of Oral and Maxillofacial Surgeons position paper on medication-related osteonecrosis of the jaw—2014 update. J Oral Maxillofac Surg. 2014;Oct 72(10):1938–56. Khan AA, Morrison A, Hanley DA, Felsenberg D, McCauley LK, O'Ryan F, Reid IR, Ruggiero S, Taguchi A, Tetradis S, Watts NB, Brandi ML, Peters E, Guise T, Eastell R, Cheung AM1, Morin SN17, Masri B, Cooper C, Morgan S, Obermayer-Pietsch B, Langdahl BL, Al Dabagh R, Davison KS, Kendler D, Sándor GK, Josse, RG, Bhandari, M, El Rabbany, M, Pierroz, DD, Sulimani, R, Saunders, DP, Brown JP, Compston J. Diagnosis and Management of Osteonecrosis of the Jaw: A Systematic Review and International Consensus. J Bone Miner Res. 2015 Jan;30(1):3-23. Marx RE. Pamidronate (Aredia) and zoledronate (Zometa) induced avascular necrosis of the jaws: a growing epidemic. J Oral Maxillofac Surg. 2003;61:1115–7. Ruggiero SL, Mehrotra B, Rosenberg TJ, Engroff SL. Osteonecrosis of the jaws associated with the use of bisphosphonates: a review of 63 cases. J Oral Maxillofac Surg. 2004;62:527–34. Aghaloo TL, Felsenfeld AL, Tetradis S Osteonecrosis of the jaw in a patient on Denosumab. J Oral Maxillofac Surg. 2010;68:959-963.
guidelines for bisphosphonate associated osteonecrosis of the jaw. Peters E, Lovas GL, Wysocki GP. Lingual mandibular sequestration and ulceration. Oral Surg Oral Med Oral Pathol. 1993;75:739–43. 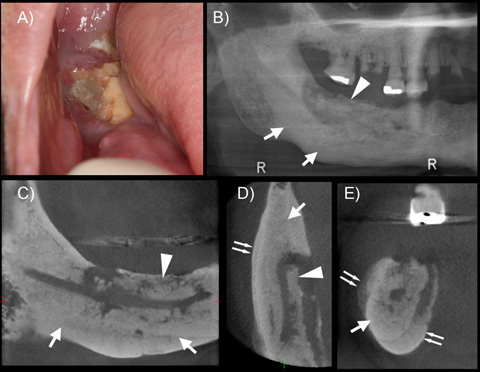 Scully C. Oral ulceration: a new unusual complication. Br Dent J. 2002;192:139–40. Sonnier KE, Horning GM. Spontaneous bony exposure: a report of 4 cases of idiopathic exposure and sequestration of alveolar bone. J Periodontol. 1997;68:758–62. Kassolis JD, Scheper M, Jham, Reynolds MA. Histopathologic findings in bone from edentulous alveolar ridges: A Role in Osteonecrosis of the Jaws? Bone 2010;47:127–30. Ruggiero SL, Fantasia J, Carlson E. Bisphosphonate-related osteonecrosis of the jaw: background and guidelines for diagnosis, staging and management. Oral Surg Oral Med Oral Pathol Oral Radiol Endod. 2006;102:433–41. Khan AA, Rios LP, Sandor GK, Khan N, Peters E, Rahman MO, Clokie CM, Dore E, Dubois S. Bisphosphonate-associated osteonecrosis of the jaw in Ontario: a survey of oral and maxillofacial surgeons. J Rheumatol. 2011;38:1396–402. Etminan M, Aminzadeh K, Matthew IR, Brophy JM. Use of oral bisphosphonates and the risk of aseptic osteonecrosis: a nested case-control study. J Rheumatol. 2008;35:691–5. Tennis P, Rothman KJ, Bohn RL, Tan H, Zavras A, Laskarides C, Calingaert B, Anthony MS. Incidence of osteonecrosis of the jaw among users of bisphosphonates with selected cancers or osteoporosis. Pharmacoepidemiol Drug Saf. 2012;21:810–17. Saad F, Brown JE, Van PC, Ibrahim T, Stemmer SM, Stopeck AT, Diel IJ, Takahashi S, Shore N, Henry DH, Barrios CH, Facon T, Senecal F, Fizazi K, Zhou L, Daniels A, Carriere P, Dansey R Incidence, risk factors, and outcomes of osteonecrosis of the jaw: integrated analysis from three blinded active-controlled phase III trials in cancer patients with bone metastases. Ann Oncol. 2012;23:1341-1347. Christodoulou C, Pervena A, Klouvas G, Galani E, Falagas ME, Tsakalos G, Visvikis A, Nikolakopoulou A, Acholos V, Karapanagiotidis G, Batziou E, Skarlos DV. Combination of bisphosphonates and antiangiogenic factors induces osteonecrosis of the jaw more frequently than bisphosphonates alone. Oncology. 2009;76:209–11. Allen MR. Animal models of osteonecrosis of the jaw. J Musculoskelet Neuronal Interact. 2007;7:358–60. Allen MR. Bisphosphonates and osteonecrosis of the jaw: moving from the bedside to the bench. Cells Tissues Organs. 2009;189:289– 94. Fournier P, Boissier S, Filleur S, Guglielmi J, Cabon F, Colombel M, Clezardin P. Bisphosphonates inhibit angiogenesis in vitro and testosterone-stimulated vascular re- growth in the ventral prostate in castrated rats. Cancer Res. 2002;62:6538–44. Santini D, Vincenzi B, Dicuonzo G, Avvisati G, Massacesi C, Battistoni F, Gavasci M, Rocci L, Tirindelli MC, Altomare V, Tocchini M, Bonsignori M, Tonini G. Zoledronic acid induces significant and long-lasting modifications of circulating angiogenic factors in cancer patients. Clin Cancer Res. 2003;9:2893–7. Vincenzi B, Santini D, Dicuonzo G, Battistoni F, Gavasci M, La CA, Grilli C, Virzi V, Gasparro S, Rocci L, Tonini G. Zoledronic acid-related angiogenesis modifications and survival in advanced breast cancer patients. J Interferon Cytokine Res. 2005;25:144–51. Hansen T, Kirkpatrick CJ, Walter C, Kunkel M. Increased numbers of osteoclasts expressing cysteine proteinase cathepsin K in patients with infected osteoradionecrosis and bisphosphonate-associated osteonecrosis — a paradoxical observation? Virchows Arch 2006;449:448–54. Hansen T, Kunkel M, Weber A, James Kirkpatrick C. Osteonecrosis of the jaws in patients treated with bisphosphonates — histomorphologic analysis in comparison with infected osteoradionecrosis. J Oral Pathol Med. 2006;35:155–6. Bedogni A, Blandamura S, Lokmic Z, Palumbo C, Ragazzo M, Ferrari F, Tregnaghi A, Pietrogrande F, Procopio O, Saia G, Ferretti M, Bedogni G, Chiarini L, Ferronato G, Ninfo V, Lo RL, Lo ML, Nocini PF . Bisphosphonate-associated jawbone osteonecrosis: a correlation between imaging techniques and histopathology. Oral Surg Oral Med Oral Pathol Oral Radiol Endod 2008 Mar;105(3):358–64. Marx RE, Cillo JE, Jr., Ulloa JJ. Oral bisphosphonate-induced osteonecrosis: risk factors, prediction of risk using serum CTX testing, prevention, and treatment. J Oral Maxillofac Surg 65:2397-2410. Hutchinson M, O'Ryan F, Chavez V, Lathon PV, Sanchez G, Hatcher DC, Indresano AT, Lo JC. Radiographic findings in bisphosphonate-treated patients with stage 0 disease in the absence of bone exposure. J Oral Maxillofac Surg 2010;68:2232-2240. Dore F, Filippi L, Biasotto M, Chiandussi S, Cavalli F, Di LR. Bone scintigraphy and SPECT/CT of bisphosphonate-induced osteonec- rosis of the jaw. J Nucl Med. 2009;50:30–5. Treister NS, Friedland B, Woo SB. Use of cone-beam computerized tomography for evaluation of bisphosphonate-associated osteo-necrosis of the jaws. Oral Surg Oral Med Oral Pathol Oral Radiol Endod. 2010;109:753–64. Stockmann P, Hinkmann FM, Lell MM, Fenner M, Vairaktaris E, Neukam FW, Nkenke E. Panoramic radiograph, computed tomography or magnetic resonance imaging. Which imaging technique should be preferred in bisphosphonate- associated osteonecrosis of the jaw? A prospective clinical study. Clin Oral Investig 2010;14:311–7. Torres SR, Chen CS, Leroux BG, Lee PP, Hollender LG, Schubert MM. Fractal dimension evaluation of cone beam computed tomography in patients with bisphosphonate-associated osteonecrosis. Dentomaxillofac Radiol. 2011;40:501–5. Arce K, Assael LA, Weissman JL, Markiewicz MR. Imaging findings in bisphosphonate-related osteonecrosis of jaws. J Oral Maxillofac Surg. 2009;67:75–84. O'Ryan FS, Khoury S, Liao W, Han MM, Hui RL, Baer D, Martin D, Liberty D, Lo JC. Intravenous bisphosphonate- related osteonecrosis of the jaw: bone scintigraphy as an early indicator. J Oral Maxillofac Surg. 2009;67:1363–72. Chiandussi S, Biasotto M, Dore F, Cavalli F, Cova MA, Di Lenarda R. Clinical and diagnostic imaging of bisphosphonate-associated osteonecrosis of the jaws. Dentomaxillofac Radiol. 2006;35:236–43. Suei Y. Radiographic findings of bisphosphonate-related osteomyelitis of the jaw: investigation of the diagnostic points by comparison with radiation osteomyelitis, suppurative osteomyelitis, and diffuse sclerosing osteomyelitis. Oral Radiol 29:121-134. White S, Pharoah M. Oral radiology. 6th ed. St. Louis, MO, USA: Mosby 2008. .Phal PM, Myall RW, Assael LA, Weissman JL. Imaging findings of bisphosphonate-associated osteonecrosis of the jaws. AJNR Am J Neuroradiol. 2007;28:1139–45. Bianchi SD, Scoletta M, Cassione FB, Migliaretti G, Mozzati M. Computerized tomographic findings in bisphosphonate-associated osteonecrosis of the jaw in patients with cancer. Oral Surg Oral Med Oral Pathol Oral Radiol Endod. 2007;104:249–58. Bedogni A, Blandamura S, Lokmic Z, Palumbo C, Ragazzo M, Ferrari F, Tregnaghi A, Pietrogrande F, Procopio O, Saia G, Ferretti M, Bedogni G, Chiarini L, Ferronato G, Ninfo V, Lo RL, Lo ML, Nocini PF. Bisphosphonate-associated jawbone osteonecrosis: a correlation between imaging techniques and histopathology. Oral Surg Oral Med Oral Pathol Oral Radiol Endod. 2008;105:358–64. Elad S, Gomori MJ, Ben-Ami N, Friedlander-Barenboim S, Regev E, Lazarovici TS, Yarom N. Bisphosphonate-related osteonecrosis of the jaw: clinical correlations with computerized tomography presentation. Clin Oral Investig. 2010;14:43–50. Fatterpekar GM, Emmrich JV, Eloy JA, Aggarwal A. Bone-within-bone appearance: a red flag for biphosphonate-associated osteonecrosis of the jaw. J Comput Assist Tomogr. 2011;35:553–6. Taguchi A, Akiyama H, Koseki T, Shimizutani K. Recognition of bisphosphonate-related osteonecrosis of the jaw among oral and maxillofacial radiologists: results from a questionnaire-based survey in Japan. Oral Radiol. 2013;29:98–104. Junquera L, Gallego L. Nonexposed bisphosphonate-related osteonecrosis of the jaws: another clinical variant? J Oral Maxillofac Surg. 2008;66:1516–7. Sedghizadeh PP, Kumar SK, Gorur A, Schaudinn C, Shuler CF, Costerton JW. Microbial biofilms in osteomyelitis of the jaw and osteonecrosis of the jaw secondary to bisphosphonate therapy. J Am Dent Assoc. 2009;140:1259–65. Tetradis S, Anstey P, Graff-Radford S. Cone beam computed tomography in the diagnosis of dental disease. J Calif Dent Assoc 38:27-32. Scarfe WC, Li Z, Aboelmaaty W, Scott SA, Farman AG. Maxillofacial cone beam computed tomography: essence elements steps to interpretation. Aust Dent J. 2012;57(Suppl 1):46–60. Torres SR, Chen CS, Leroux BG, Lee PP, Hollender LG, Santos EC, Drew SP, Hung KC, Schubert MM. Mandibular cortical bone evaluation on cone beam computed tomography images of patients with bisphosphonate-related osteonecrosis of the jaw. Oral Surg Oral Med Oral Pathol Oral Radiol. 2012;113:695–703. Surg Oral Med Oral Pathol Oral Radiol. 2012;114:804–11. Ariji Y, Ariji E. Role of magnetic resonance imaging in diagnosis of bisphosphonate-related osteonecrosis of the jaw. Oral Radiol. 2013;29(2):111–20. Popovic KS, Kocar M. Imaging findings in bisphosphonate-induced osteonecrosis of the jaws. Radiol Oncol. 2010;Dec 44(4):215–9. Chiandussi S, Biasotto M, Dore F, Cavalli F, Cova MA, Di LR. 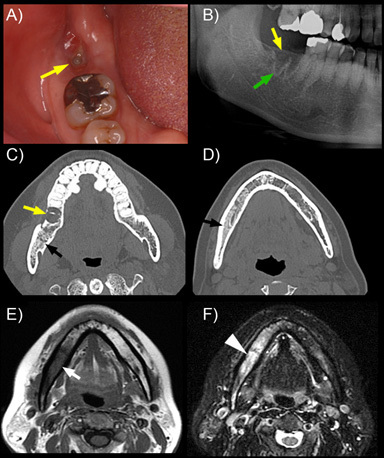 Clinical and diagnostic imaging of bisphosphonate-associated osteonecrosis of the jaws. Dentomaxillofac Radiol 35:236-243. Dore F, Filippi L, Biasotto M, Chiandussi S, Cavalli F, Di LR. Bone scintigraphy and SPECT/CT of bisphosphonate-induced osteonecrosis of the jaw. J Nucl Med 50:30-35. Van den Wyngaert T, Huizing MT, Fossion E, Vermorken JB. Prognostic value of bone scintigraphy in cancer patients with osteonecrosis of the jaw. Clin Nucl Med. 2011;36:17–20. PET scans to support diagnosis of jaw osteonecrosis. Ann Hematol. 2007;86:415–23. multiple metastases to facial and cranial bones: a case report. Eur J Dent. 2010;4:334–7. Myers DT, Karvelis KC. Incidental finding of periodontal disease on bone scan. Clin Nucl Med. 1994;19:644–5. of the jaw. Oral Surg Oral Med Oral Pathol Oral Radiol Endod. 2009;107:412–9. Raje N, Woo SB, Hande K, Yap JT, Richardson PG, Vallet S, Treister N, Hideshima T, Sheehy N, Chhetri S, Connell B, Xie W, Tai YT, Szot-Barnes A, Tian M, Schlossman RL, Weller E, Munshi NC, Van Den Abbeele AD, Anderson KC. Clinical, radiographic, and biochemical characterization of multiple myeloma patients with osteonecrosis of the jaw. Clin Cancer Res. 2008;14:2387–95. Dimopoulos MA, Kastritis E, Bamia C, Melakopoulos I, Gika D, Roussou M, Migkou M, Eleftherakis-Papaiakovou E, Christoulas D, Terpos E, Bamias A. Reduction of osteonecrosis of the jaw (ONJ) after implementation of preventive measures in patients with multiple myeloma treated with zoledronic acid. Ann Oncol. 2009;20:117–20. with bisphosphonates. The experience of the National Cancer Institute of Milan Ann Oncol 2009;20:137–45. Bedogni A, Saia G, Ragazzo M, Bettini G, Capelli P, D'Alessandro E, Nocini PF, Lo RL, Lo ML, Blandamura S. Bisphosphonate-associated osteonecrosis can hide jaw metastases. Bone. 2007;41:942–5. Chaturvedi P, Pai PS, Chaukar DA, Gupta S, D'cruz AK. Bisphosphonate induced osteonecrosis of the jaw masquerading as tumor: a word of caution for oral surgeons and oncologists. Eur J Surg Oncol. 2010;36:541–5. related osteonecrosis of the jaw: a pictorial review. Radiographics. 2009;29:1971–84. American Association of Endodontists;American Academy of Oral and Maxillofacial Radiography. AAE and AAOMR joint position statement. Use of cone beam computed tomography in endodontics. Pa Dent J (Harrisb). 2011;78:37–9. Tyndall DA, Price JB, Tetradis S, Ganz SD, Hildebolt C, Scarfe WC. Position statement of the American Academy of Oral and Maxillofacial Radiology on selection criteria for the use of radiology in dental implantology with emphasis on cone beam computed tomography. Oral Surg Oral Med Oral Pathol Oral Radiol. 2012;113:817–26. 2012. [cited 2014 Nov 23]. Available from: http://www.ada.org/media/ADA/Member%20Center/Files/ Dental_Radiographic_Examinations_2012.ashx. Wilde F, Heufelder M, Winter K, Hendricks J, Frerich B, Schramm A, Hemprich A. The role of surgical therapy in the management of intravenous bisphosphonates-related osteonecrosis of the jaw. Oral Surg Oral Med Oral Pathol Oral Radiol Endod. 2011;111:153–63. Mucke T, Koschinski J, Deppe H, Wagenpfeil S, Pautke C, Mitchell DA, Wolff KD, Holzle F. Outcome of treatment and parameters influencing recurrence in patients with bisphosphonate-related osteonecrosis of the jaws. J Cancer Res Clin Oncol. 2011;137:907–13.